On your wedding day, the last thing you want to worry about is transportation. And with Executive’s expert Long Island Wedding Transportation Services, you don’t have to! We’ll provide reliable and luxurious transportation to all of your important wedding festivities, whether we’re picking you and your bridesmaids up from wherever you’re getting ready, bringing you to the ceremony, taking you to the reception banquet hall, or heading to a photo session destination. Don’t Spend Your Wedding Day Worrying About Transportation! When it comes to wedding transportation, we’re there for you in every way. Wedding transportation is one of our favorite services and we have special wedding limousines that are ready to pick up the Bridal Party, the Groomsmen, and even other special guests, such as the mother and father of the bride and groom! Whether we need to send one wedding limousine or three, you will receive personalized Wedding Limousine Service for your Wedding Party, so that you can relax and arrive in style. Whether you prefer the classic Stretch White Wedding Limousine or our beautiful Rolls Royce (complete with a complimentary bottle of champagne for the bride & groom), our fleet has it. You can also book the fabulous Party Bus if you want “the” ride extraordinaire! Plus, if the reception hall has limited parking, or if you are concerned about your guests returning home safely, consider hiring our shuttle service. Let our Chauffeurs be the designated drivers, so you and your guests can have a great night! 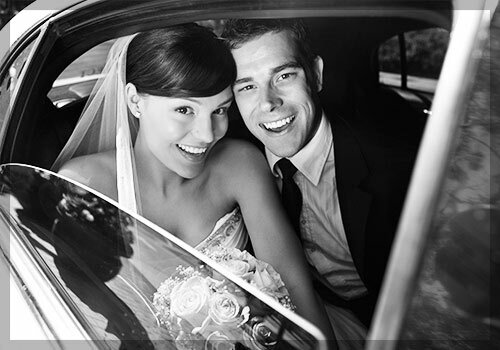 Executive’s Wedding Transportation Limousines are also great for out-of-town guests and rehearsal dinners. You can arrange for us to pick up your guests from the airport and bring them to their hotels. Rest assured you are in good hands when you choose Executive’s Wedding Limousines. If you are looking for luxurious, courteous and reliable Wedding Transportation on Long Island, you have come to the right company! Executive’s Long Island Wedding Transportation is willing to go the extra mile to ensure that your day is as exceptional and as memorable as you envision it to be! Our Wedding Coordinators will be able to answer any questions you may have and help make your big day run as smoothly as possible. Call us today at (516) 826-8172 or toll free at (888) 245-3556.